Blade Specs: .024" x .012" x 48 tpi. Universal size - No.1. Comes in pack of 12. 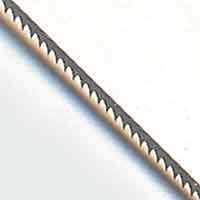 These jeweller's saw blades are premium grade saw blades. Hardest temper provides a longer working life for proficient users, however these blades are less forgiving to beginners who tend to 'tweak' their saws. Contains wired bundle of 12 blades. 61 TPI is the finest cutting blade and 38 TPI being the most course. Finer blades for metal and courser for wood products. Click the button below to add the Jewellers Saw Blades 5" 48-TPI (pac 12) to your wish list.